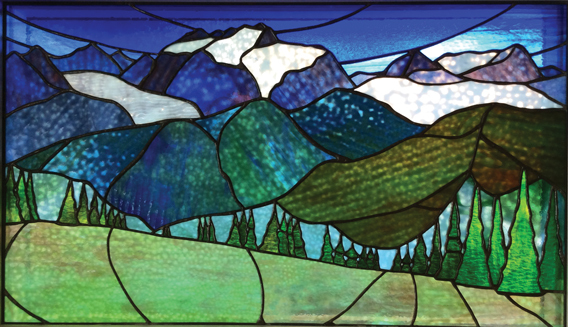 Stained glass is a living, experimental medium and an almost mysterious substance. I first started doing water colour and oil paintings and then moved to slide photography; I used Kodachrome film as my preferred choice for its rich colour and reproduction quality. 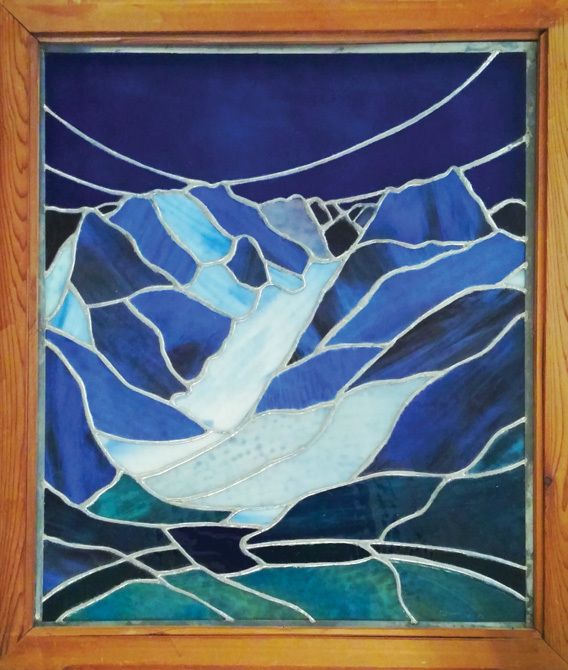 All of the landscapes in my glass work developed from these photos and first hand observations. 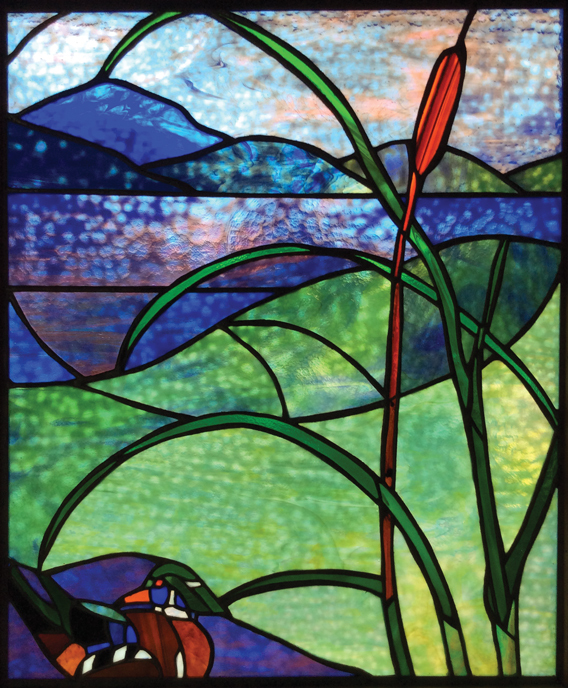 I also made an effort to view glass works and other graphic arts in different settings, including museums and public locations. Glass interacts with light from all sources. Because of this, it is not possible for an artist to know how a work will turn out until it is viewed in a specific setting. For this reason, I constructed multiple versions of the same pattern in framed panels; these can easily be moved to different locations to compare them throughout the day, during different seasons and in walls facing different directions. 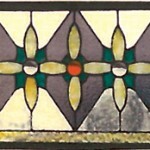 Stained glass is a living, experimental medium and an almost mysterious substance. I designed and constructed many projects between 1975 and 1989. 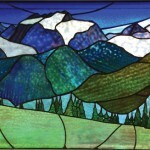 Since 1989 the designs were mostly on paper and not constructed in glass. The materials and tools from my studio remain in the Drengson-Stevens home. There is a light table, glass-filled racks, and tools for design, layout and construction. Some of the finished projects are mounted in wooden frames and hang in our studio and home, or the homes of our daughters and other people as noted in the captions. Some panels are mounted in antique cabinets. Many of these projects were done as commissions or trades for services in kind. Most of the glass now in the studio racks is from Bullseye Glass in Portland, Oregon, USA. It was bought from the factory retail racks, and much of this Bullseye is “curious.” Curious glass deviates from factory standards in patterns and colors, as shown in company sample boxes. 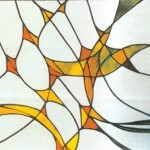 Some of the other glass used in these constructions is from Spectrum Glass in Seattle, Washington. 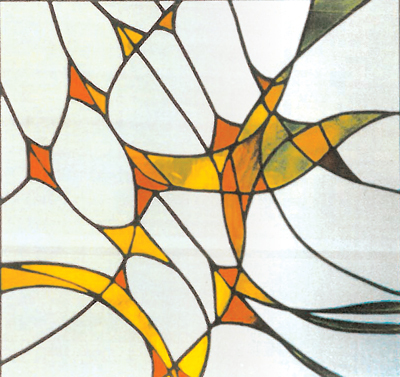 This cathedral glass has good color, transparency and clarity. Bullseye is noted for its opalescence with strong colors and good diffusion. Most of these projects used Tiffany-style construction with copper foil around the edge of each piece that were then soldered in place with 60/40 solder. 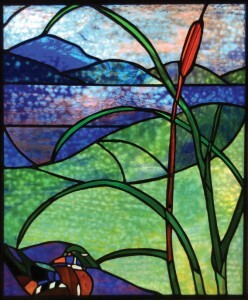 The glass was first cut from a pattern on a special light table so that the pieces are illuminated. They were then foiled on a workbench and put on a plywood board to solder. The panel when soldered becomes a single unit; it is then finished with an aluminum alloy edge frame. Glass seems to be a solid but it is a fluid and slowly settles downward, so that vertically placed glass pieces become thicker at the bottom edge over many years. Obsidian is a black glass formed from volcanic action and there are other forms of naturally occurring glass, whose main ingredient when manufactured is sand that is heated to very high temperatures. Plates made from clay become pottery when glazed and fired in kilns. Metal and glass working require control of an air stream such as a bellows and a coal fire. The revolution in glass arts that made the great cathedrals possible started in the Middle East and spread to Europe. Glass arts, crafts and technology were later instrumental to the Modern revolution, for it produced lenses for eyeglasses, magnifying glasses, microscopes and telescopes. These combined techniques and technologies radically change the way we see and think about the world; they give us threefold perspectives, from the micro and midrange, to the macro and telescopic. The revolution in glass arts that made the great cathedrals possible started in the Middle East and spread to Europe. When in a cathedral built during the Middle Ages (500AD to 1500AD), the vast stain glass windows give you feelings of awe, reverence and space. These cathedrals would not have been possible without the glass arts that let them soar into large open vaults and arches with sun brilliant rainbow colored-lights inside, each with different visions of reality. 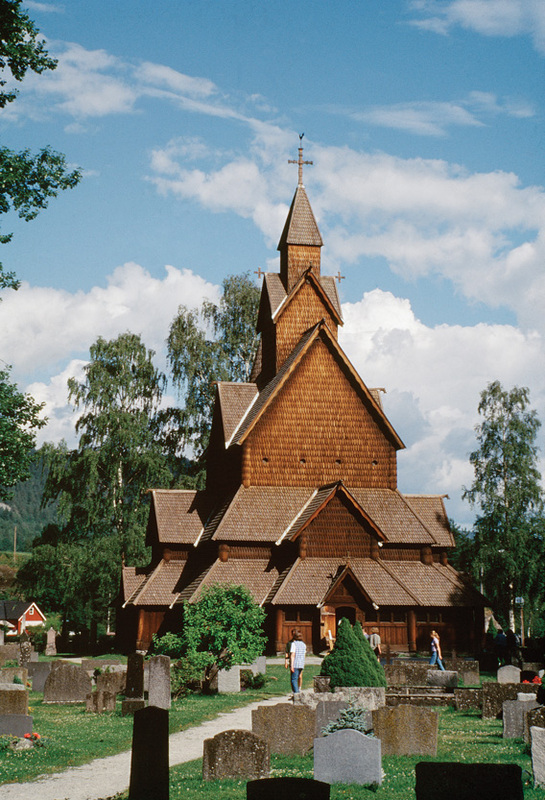 The wooden stave churches of Norway are beautiful in their own way, but they do not have the light of these great cathedrals, such as the Nidaros Cathedral (built about 1000AD) in Trondheim, Norway. There are stave and other churches in the Trondheim area. Glass art has evolved even in the last 25 years and now uses fusion and other techniques. Glass is made into downhill skies and can be bulletproof if tempered. 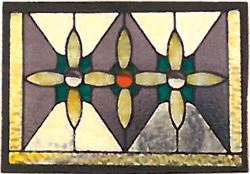 More information can be found online by searching for stain glass windows in the United States and Canada and especially cathedrals in Victoria, British Columbia.